Springville, CA, May 20, 2009 – TEDCF Publishing, a leading Autodesk Authorized Publisher of interactive courses for Autodesk Inventor, today announced the availability of Autodesk Inventor 2010: Solid Modeling, the first in a series of certified courses for Autodesk Inventor 2010. Autodesk Inventor 2010: Solid Modeling shows how the commands works while author David Melvin, PE explains how to apply techniques and sound processes that maximize your productivity and the quality of your work. You watch computer-based lessons that start with the basics and progressively build a strong understanding of how to use modeling commands effectively. The Solid Modeling 2010 course is the first course in a series followed by Assemblies and Advanced Concepts 2010. The Lesson Player, shown above, fills a 1024 X 768 screen. It automatically tracks your study sessions, so all you need is a computer with speakers and a CD Drive, and the Lesson Player does the rest. 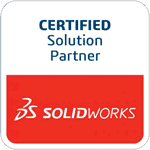 Learn more about Accelerated Productivity 2010: Solid Modeling.